Our life expectancy –the number of years we are expected to live from the time we are born – is an important measure of the health of a society. Simply put, longer life expectancy is a sign of a healthier population. 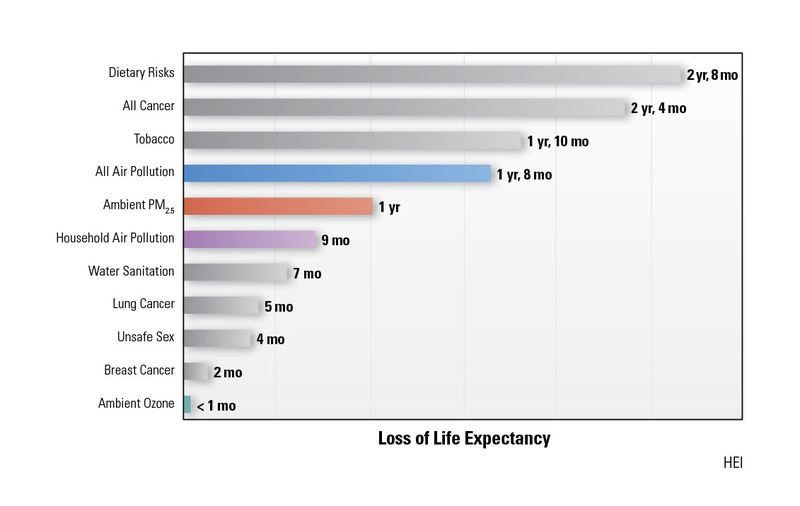 Many factors can lead to poorer health and can therefore reduce life expectancy. Air pollution is one of them. Current levels of air pollution levels have reduced life expectancy by 1 year and 8 months years on average worldwide. This means a child born today will die 20 months sooner, on average, than would be expected in the absence of air pollution. Air pollution reduces average life expectancy by almost as much as tobacco use. What are the Potential Benefits to Life Expectancy of Improving Air Quality? The better the air quality, the larger the gains in life expectancy. This figure below shows the expected gains in life expectancy if global air quality across the world met WHO’s Interim Targets for the Air Quality Guideline. Hypothetical gains in average life expectancy had countries around the world met WHO Interim Targets or the AQG. [Figure O, © HEI]. 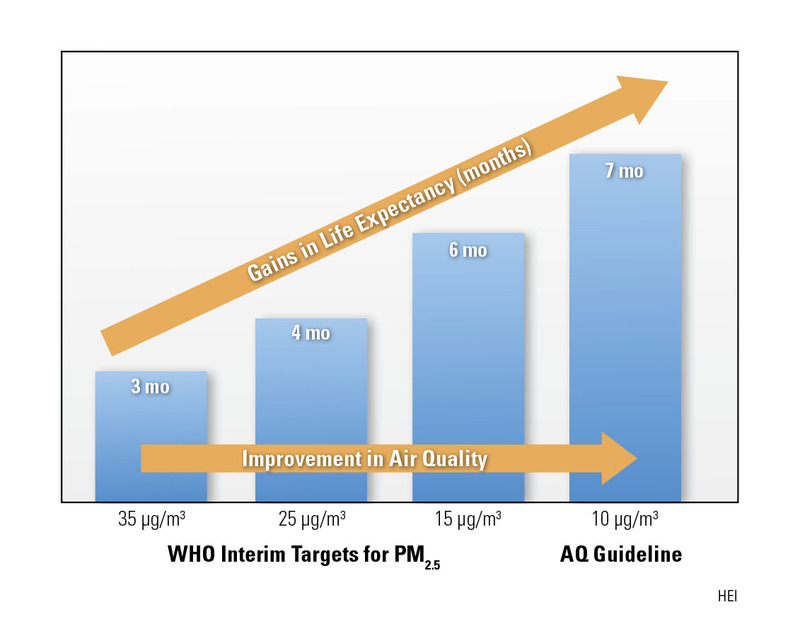 If global air quality met WHO’s Air Quality guideline for PM2.5 (10 µg/m3), people today would live an average of about 7 months longer. These estimates assume that all other risk factors and conditions remained the same for the past several decades but that PM2.5 had been kept below the limits defined by the WHO. Less-developed Countries, with Poor Air Quality, Have the Most to Gain in Life Expectancy. The red map shows the years of life expectancy lost in countries around the world given current levels of PM2.5. Switch to the green map shows the hypothetical gains in life expectancy had countries been able to hold PM2.5 to concentrations below WHO’s Air Quality guideline (10 µg/m3). Toggle to switch maps. Scroll over to see the life expectancy loss or gain in individual countries. Click on either the colored boxes or on the ranges to select and de-select different concentration ranges. To download the map, click on the black arrow at the upper right corner. The countries that currently suffer the highest PM2.5 exposures would have the most to gain from reducing air pollution. Air pollution’s impact on life expectancy is greatest in less-developed areas, where many people suffer a double burden from high ambient PM2.5 and exposure to household air pollution. How are Impacts on Life Expectancy Estimated? Life expectancy is a statistical estimate of the average lifespan (that is, years from birth to death) that individual in a population is expected to live. It takes into account all of the factors that affect life expectancy in that population including age and gender, underlying health status, smoking, diet, and other risk factors like air pollution. To assess the impact of a particular factor on life expectancy, researchers quantify the likelihood of dying from diseases related to that factor at different ages in a population and calculate a “risk-deleted” life expectancy — that is, the length of life that would be expected if the factor were absent. The average difference between life expectancy with and without the risk factor quantifies the average change in life expectancy attributable to that factor. The life expectancy findings presented here are based on the work of Assistant Professor Joshua Apte using 2016 data and methods from the Global Burden of Disease project. For more details, please consult his paper.